The latest on flooding caused by former Hurricane Florence. A North Carolina school superintendent says two of the six schools in his system will have to be demolished because of water damage caused by Hurricane Florence. Jones County School Superintendent Michael Bracy said Jones Middle and Trenton Elementary schools received at least 3 feet (0.9 meters) of water in portions of the respective buildings. Bracy said by the time workers could get into the schools, mold and mildew had already formed. Bracy says the system is building a brand new K-12 school for those students, scheduled to open in August 2019. In the meantime, efforts are underway to relocate them temporarily to other schools that weren’t affected by Florence. A North Carolina university closed because of Hurricane Florence is about to resume its fall semester. The University of North Carolina at Wilmington announced in an email sent to students that classes will resume on Oct. 1 for the majority of its students. The school said most students may move back into their dormitories beginning at 10 a.m. Saturday. Officials said there will be no access to the dorms before then. The school added that ongoing work in two dorms will keep those buildings closed to students until Oct. 6. Faculty members are being encouraged in the meantime to make virtual participation available for students unable to attend classes in person. Federal officials have amended their disaster declaration for South Carolina to allow another county to receive financial aid to recover from Hurricane Florence. Gov. Henry McMaster said Tuesday that the Federal Emergency Management Administration agreed at his request to allow assistance for Chesterfield County residents. Residents in Dillon, Horry (OR-ee), Marion and Marlboro counties were already eligible to apply for the aid. The money can be used for rental assistance and essential home repairs, and also includes low-interest loans from the U.S. Small Business Administration. Some areas of South Carolina are still experiencing historic flooding from rivers swollen by the storm, which arrived on land 11 days ago. The head of a national effort to fight income and racial inequality says North Carolina politicians should help those harmed the most by Hurricane Florence by increasing Medicaid coverage and the minimum wage. The Rev. William Barber of the Poor People’s Campaign lives in North Carolina. He and other state social justice advocates held a news conference Tuesday outside the old Capitol building in Raleigh. Barber read a letter urging Democratic Gov. Roy Cooper and Republican legislators during next week’s special session for Florence relief to expand Medicaid to cover 500,000 more people. He also seeks more affordable housing. Barber said the poor and uninsured people already were struggling before Florence, and will be worse off afterward. Cooper has already backed Medicaid expansion and raising the current $7.25 minimum wage. But it’s unlikely the GOP-controlled legislature will approve Barber’s requests. Floodwaters from Hurricane Florence aren’t in any hurry to leave South Carolina. Eleven days after the storm made landfall, the Waccamaw River at Conway is still rising — after already reaching record levels. Late Friday, the river broke the previous record set two years ago by Hurricane Mathew when it reached 17.9 feet (5.5 meters). Florence has caused the flooded river to rise to 21 feet (6.4 meters) as of Tuesday. It was expected to crest at 21.7 feet (6.6 meters), possibly on Wednesday. Forecasters say that after that, it will remain above the level reached during Matthew through at least through the beginning of next week. Former Conway City Councilwoman Vivian Chestnut says this is the worst flooding she has ever seen. She had to leave her home Wednesday as the water rose and isn’t sure when she will see it again. Georgetown is a city downriver from Conway. There, residents are also preparing for the worst flooding in their lifetimes. Officials warn it could start Wednesday. A National Weather Service meteorologist says a low-pressure area located off the coast of the Carolinas is likely to bring showers but won’t significantly increase flooding threats to areas already saturated by Hurricane Florence. Reid Hawkins is science and operations officer for the Wilmington National Weather Service office. He said in a phone interview Tuesday that the low-pressure area off the coast is expected to run into a front that will push it north. He says the system isn’t expected to become anything worse than a tropical depression. The U.S. Marine Corps is reporting that wastewater overflowed from a North Carolina base into a river in the aftermath of Hurricane Florence. A news release said the spill was discovered on Monday afternoon. The Corps said about 84,000 gallons (318,000 liters) of wastewater spilled into a low-lying area at Camp Lejeune and that about 42,000 gallons (159,000 Liters) overflowed from the low-lying area and went into the New River through a storm ditch. The news release said the spill was caused by a power-outage at a wastewater lift station during the storm and a high volume of rainfall causing an overflow of the low-lying area. Workers removed the remaining wastewater on the base and disinfected the area. The news release said that base officials have confirmed the spill doesn’t threaten its residential water supply. State environmental officials are also working with the base to take further water samples. A bipartisan group of current and former North Carolina education leaders is asking for donations to help speed recovery for school districts harmed by Hurricane Florence. State schools superintendent Mark Johnson and predecessors June Atkinson and Mike Ward joined others Tuesday in Raleigh to announce the Florence Aid to Students and Teachers program. Their push comes as the legislature prepares for a special session next week to begin distributing disaster-relief funding. The past and present leaders say they’re seeking donations for schools in need. Money will be distributed to districts through a special state education fund already in existence. Many schools in districts affected by the storm remain closed. There is no official number, but Department of Public Instruction spokesman Drew Elliot says up to 1.2 million of more than 1.5 million public school students in the state missed some amount of school because of the disaster. Red Cross officials say that residents displaced by Hurricane Florence could face difficulty finding temporary housing because of storm damage and an already-tight rental housing market. Red Cross Vice President of Operations and Logistics Brad Kieserman said that North Carolina’s rental market was already tight before the storm. He said that much of the rental market in rural North Carolina was in homes and one-story structures that were susceptible to flooding damage. He said that FEMA data indicates that tens of thousands of structures have been damaged by the storm. He said that Red Cross shelters in North Carolina have about 1,700 people in them on Tuesday, down from a peak of 22,000. He said the number is in sync with state data because the Red Cross is operating virtually all shelters in the state now. He said about 200 people are in Red Cross-run shelters in South Carolina. Funeral services are being held for the two women who drowned while being driven to a mental health facility in South Carolina through a flooded area. An obituary notes that 43-year-old Nicolette Green will be buried Wednesday in Mill Hall, Pennsylvania. Services for 45-year-old Wendy Newton of Shalotte, North Carolina, are listed as happening Friday in Hamlet. It took authorities more than 24 hours to recover the women’s bodies from the Horry County Sheriff’s Office van that was swept away last week in floodwaters in Marion County. Crews retrieved the van itself on Monday, nearly a week after the deaths. The two deputies driving the women were able to escape the sinking van. They have been placed on leave as the incident is investigated. The flooding in northeastern South Carolina from Hurricane Florence is providing the ideal breeding ground for mosquitoes. Horry County officials said in a news release Tuesday that they would begin spraying for mosquitoes Tuesday night and continuing on Wednesday and later this week. The news release said the chemicals being used are approved by the Environmental Protection Agency and pose little risk for people or animals. But county officials say those with asthma or respiratory problems may want to stay inside with doors and windows closed during the spraying. Sheriff’s deputies in North Carolina are trying to determine whether the death of a man whose body was found in a ditch is related to Hurricane Florence. News outlets reports the Wayne County Sheriff’s Office said the body of 32-year-old Marcus Jamal Wiley was found by a landscaper who was cleaning up the area along U.S. 117 south of Goldsboro on Monday. The sheriff’s office said the ditch where the victim was found had been flooded for more than a week and the water had just receded. An autopsy hasn’t determined how Wiley died, and detectives are constructing a timeline. Forecasters say a storm system off the coast of the Florence-battered Carolinas will dump even more rain on the already saturated states. The National Hurricane Center said on its website Tuesday that a broad area of low pressure about 260 miles (420 kilometers) south of Cape Hatteras, North Carolina, is producing showers and thunderstorms on its north side. Forecasters said it could become a tropical depression Tuesday as it approaches the coast, and will dump rain on the coast regardless. County officials have recommended that almost 8,000 people leave their homes — more than 10 percent of the population. Officials expect floodwaters to top several bridges, nearly cutting Georgetown County in two and leaving only one highway out during the expected crest early Thursday. The hurricane center also warned of dangerous surf and rip currents along portions of the North Carolina coast on Tuesday. 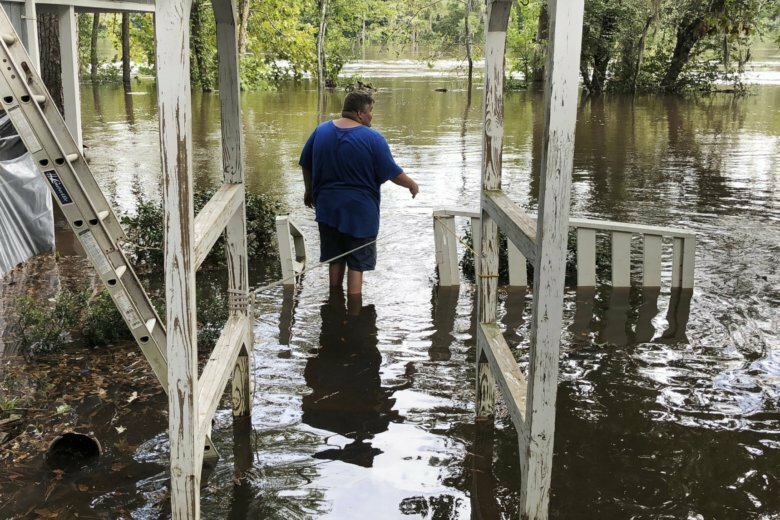 Eleven days ago, Lee Gantt was at a Hurricane Florence party in her neighborhood in Georgetown, where the story is that some houses near the Sampit River haven’t flooded since they were built before the American Revolution. Gantt will spend Tuesday with sandbags, watching the nearby river rise from Florence’s heavy rains and seeing if the luck finally runs out on her home built in 1737. The Sampit is one of five rivers that reach the Atlantic Ocean in and near Georgetown on the South Carolina coast. And Hurricane Florence — which started with record rainfall in North Carolina — is expected to cause record flooding downriver in Georgetown County as its final act. The county has recommended almost 8,000 people leave their homes — more than 10 percent of the population.